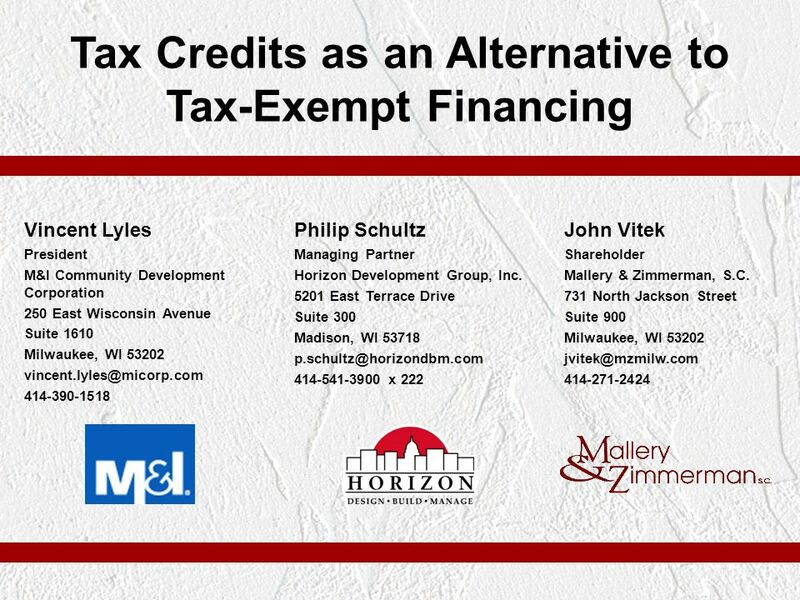 Tax Credits as an Alternative to Tax-Exempt Financing Vincent Lyles President M&I Community Development Corporation Philip Schultz Managing Partner Horizon. 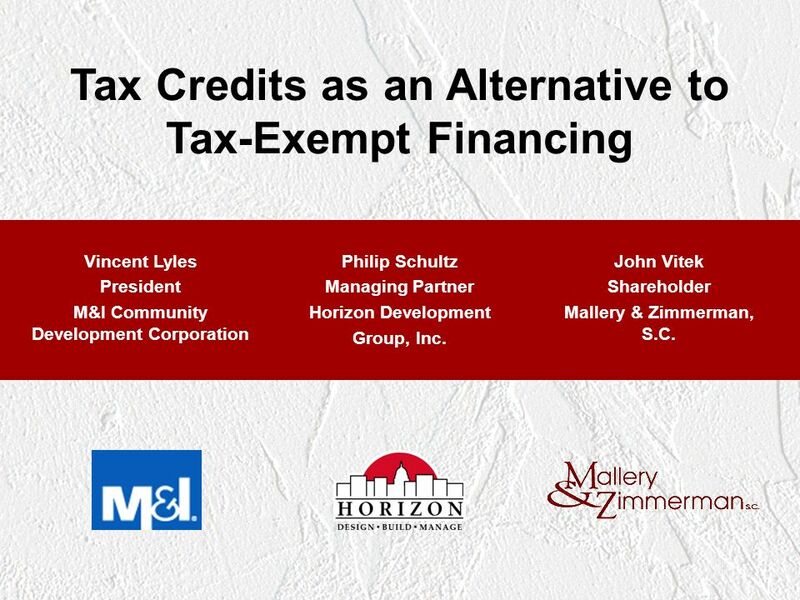 1 Tax Credits as an Alternative to Tax-Exempt Financing Vincent Lyles President M&I Community Development Corporation Philip Schultz Managing Partner Horizon Development Group, Inc. John Vitek Shareholder Mallery & Zimmerman, S.C.
12 Why Consider Housing Tax Credits? 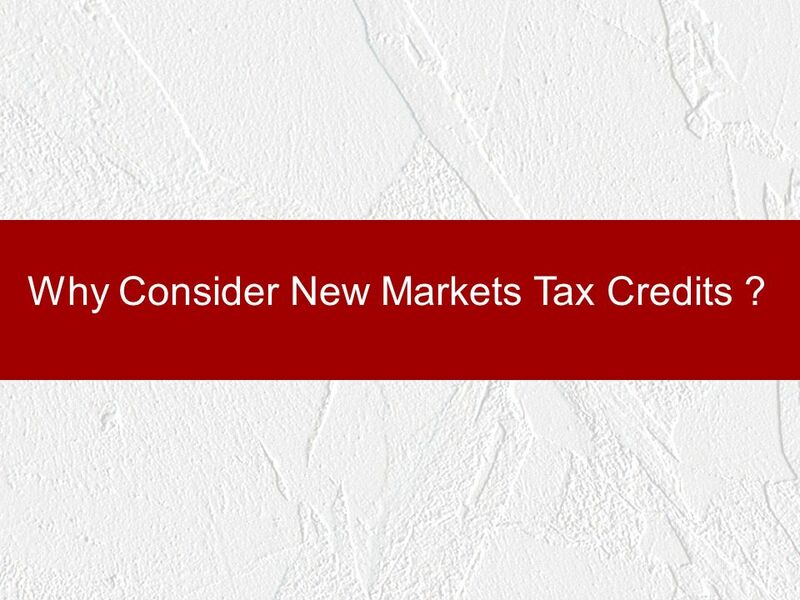 21 Why Consider New Markets Tax Credits ? 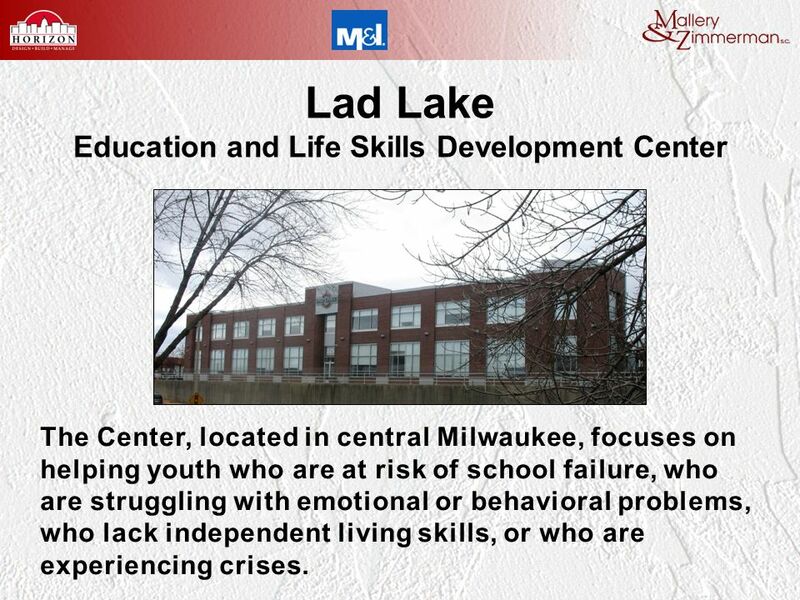 25 Lad Lake Education and Life Skills Development Center The Center, located in central Milwaukee, focuses on helping youth who are at risk of school failure, who are struggling with emotional or behavioral problems, who lack independent living skills, or who are experiencing crises. 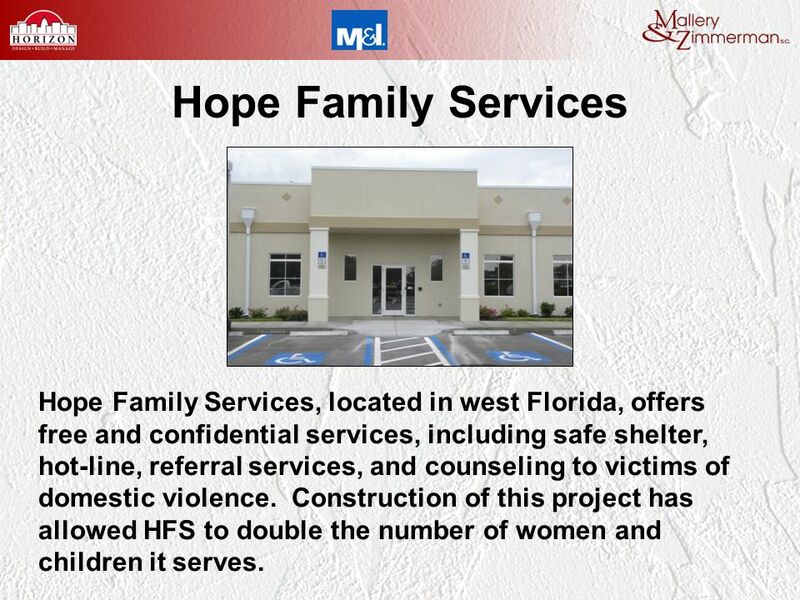 26 Hope Family Services Hope Family Services, located in west Florida, offers free and confidential services, including safe shelter, hot-line, referral services, and counseling to victims of domestic violence. 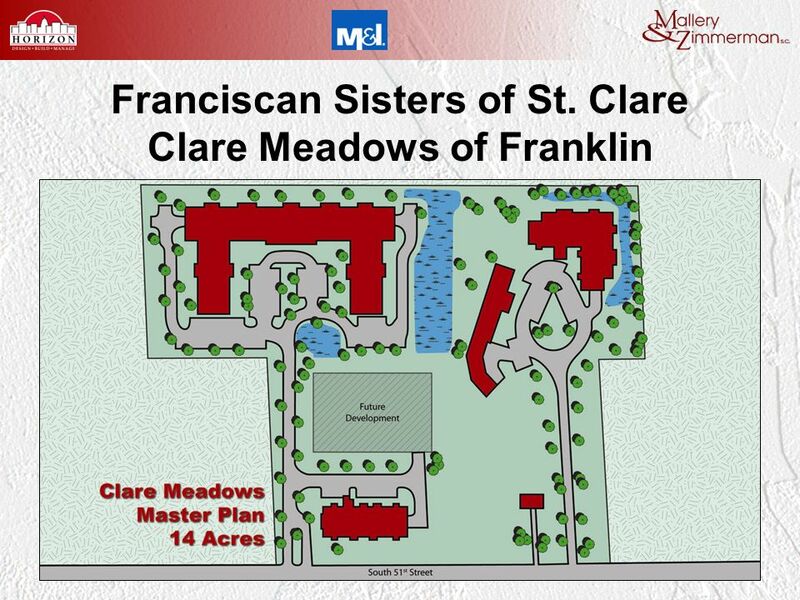 Construction of this project has allowed HFS to double the number of women and children it serves. 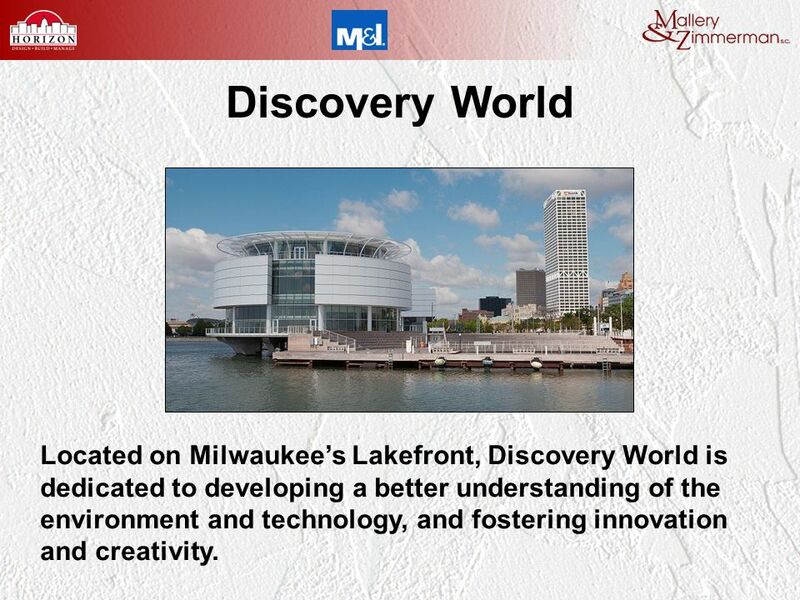 28 Discovery World Located on Milwaukees Lakefront, Discovery World is dedicated to developing a better understanding of the environment and technology, and fostering innovation and creativity. 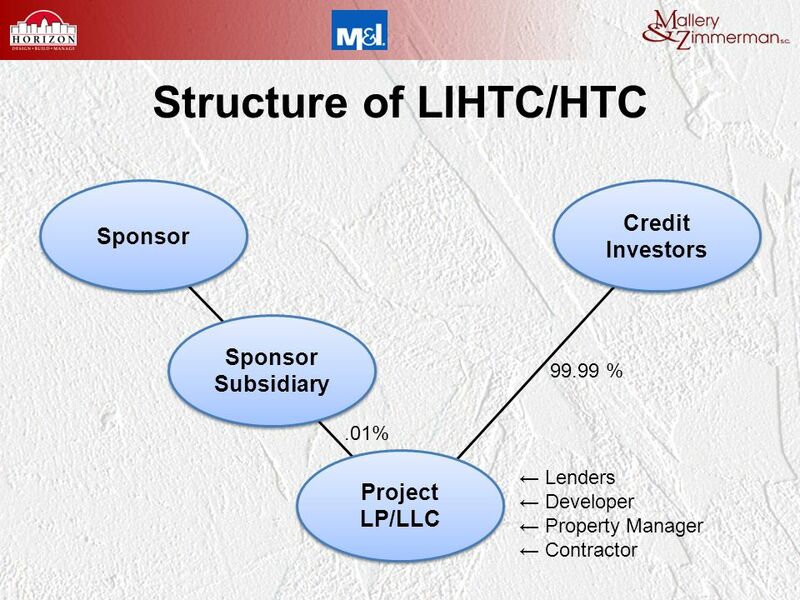 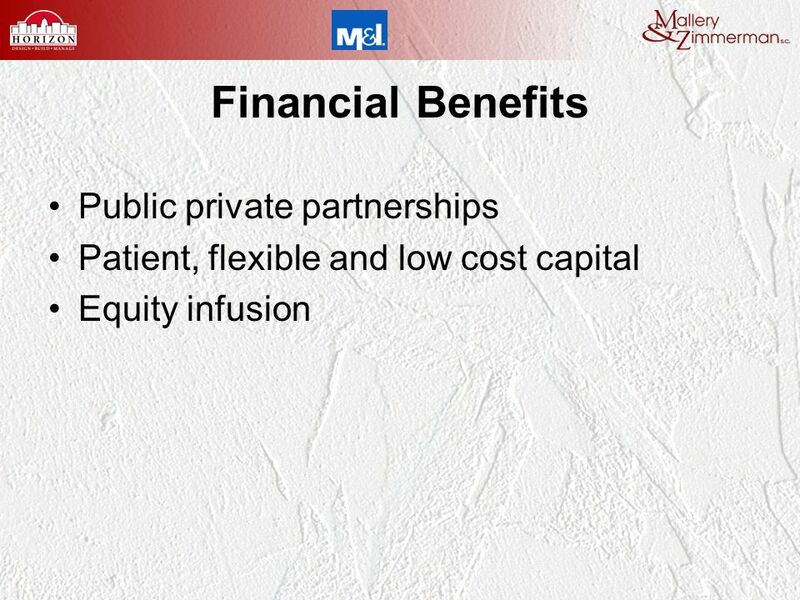 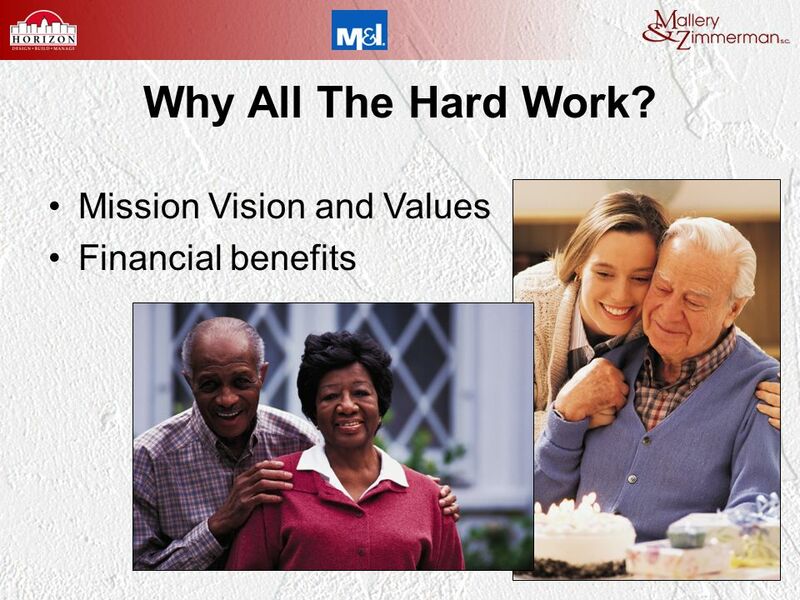 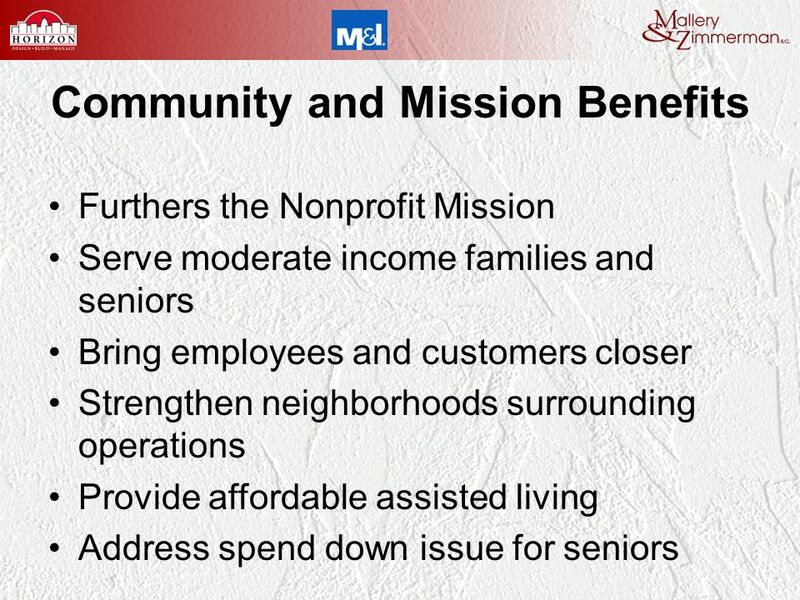 Download ppt "Tax Credits as an Alternative to Tax-Exempt Financing Vincent Lyles President M&I Community Development Corporation Philip Schultz Managing Partner Horizon." 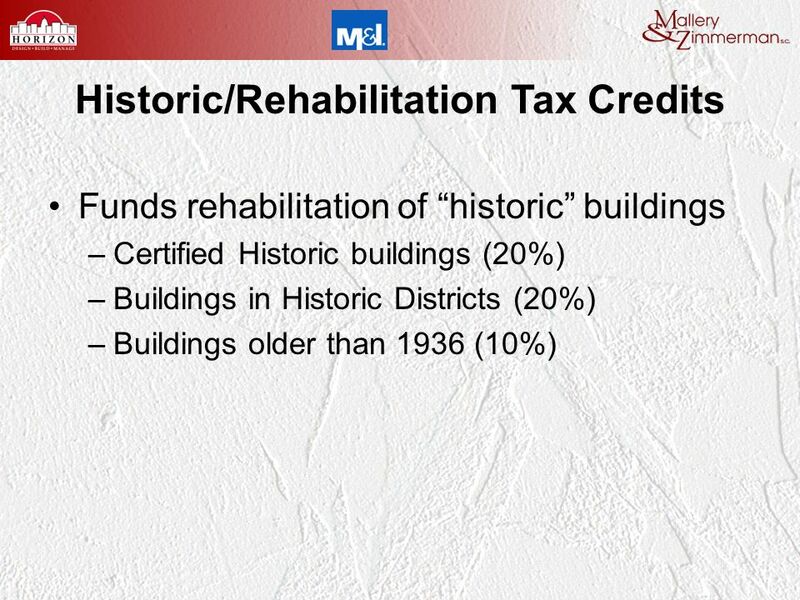 Historic Tax Credits for Developers: A Guide to Syndication and Beyond 10:45am – 12:15pm Thursday, February 8 Combining Historic Tax Credits and New Markets. 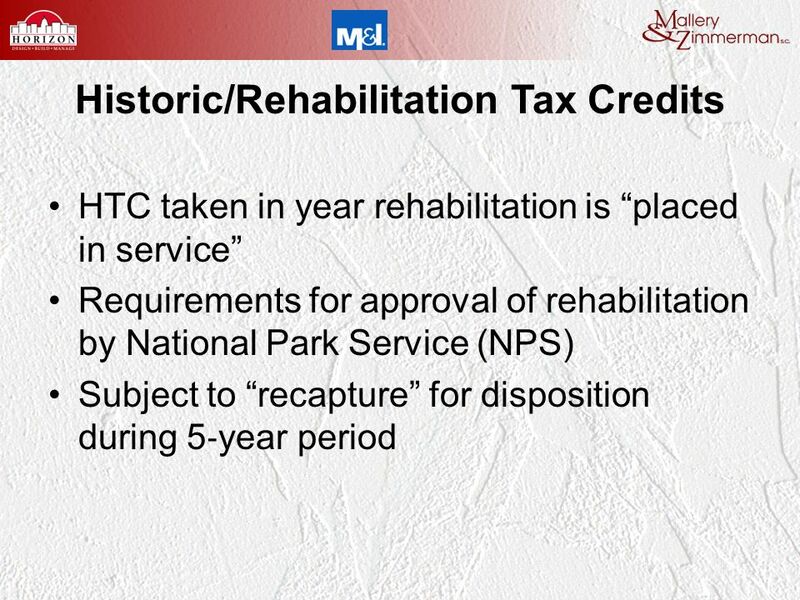 1 US Bancorp Community Development Corporation Historic and New Markets Tax Credits for the Armory: Investor Reflections (or lack thereof) Robert Wasserman. 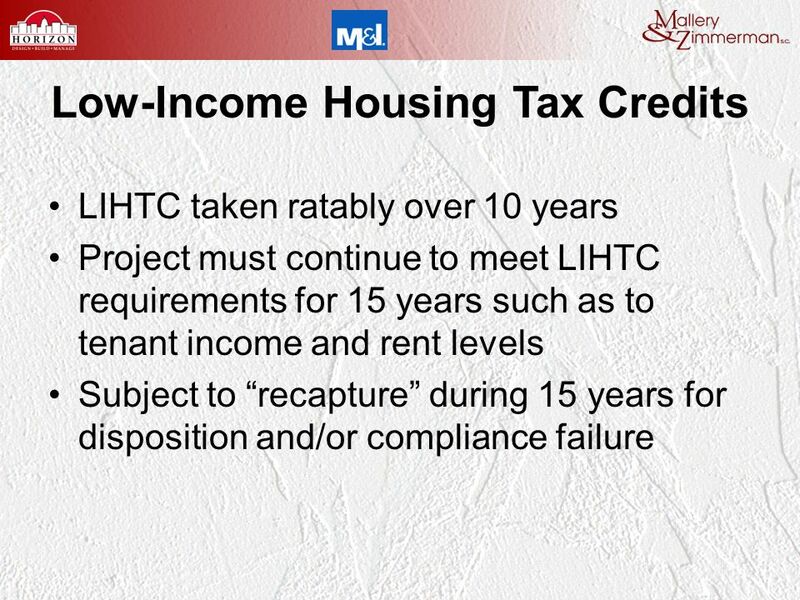 2009 Historic Tax Credits For Developers Conference All Information Contained in the Document is intended for the purpose of education and may not be reproduced. 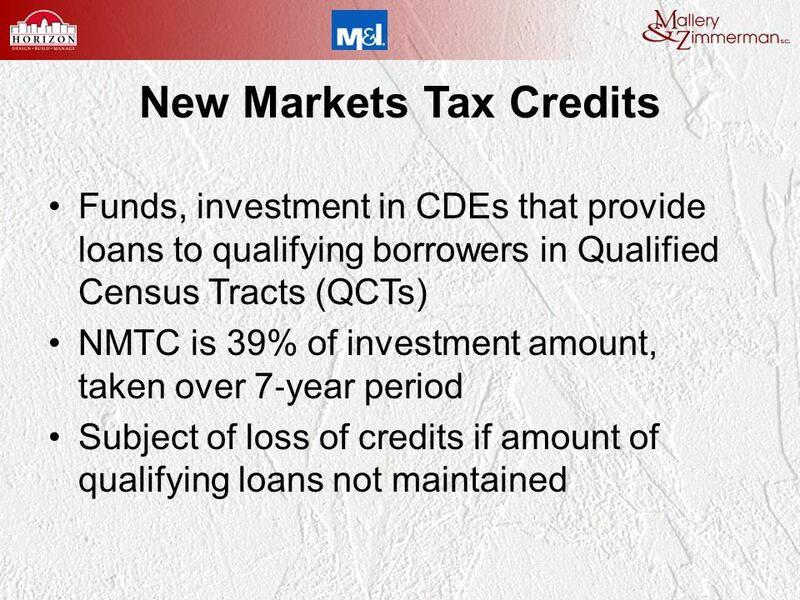 1 New Markets Tax Credits Revisited: Origins and Current Developments May 6, 2008 Herbert F. Stevens, Esq. 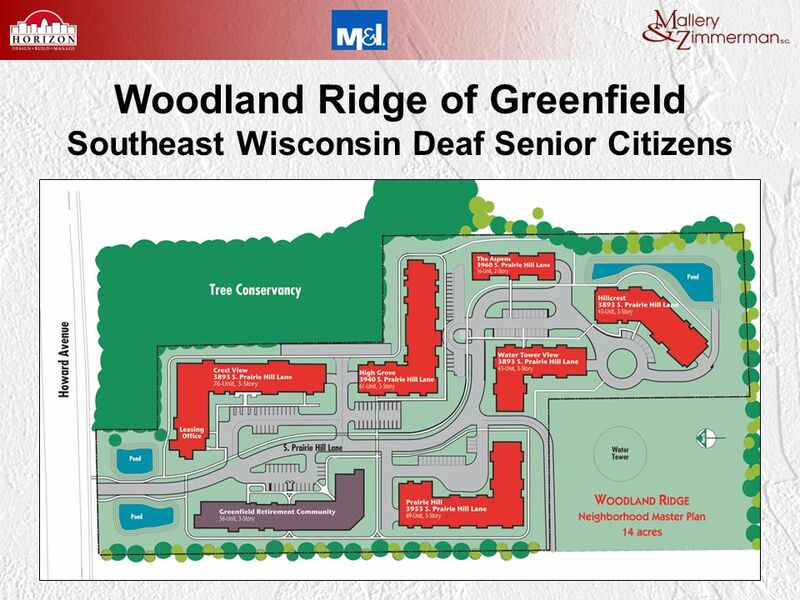 Gregory N. Doran, Esq. 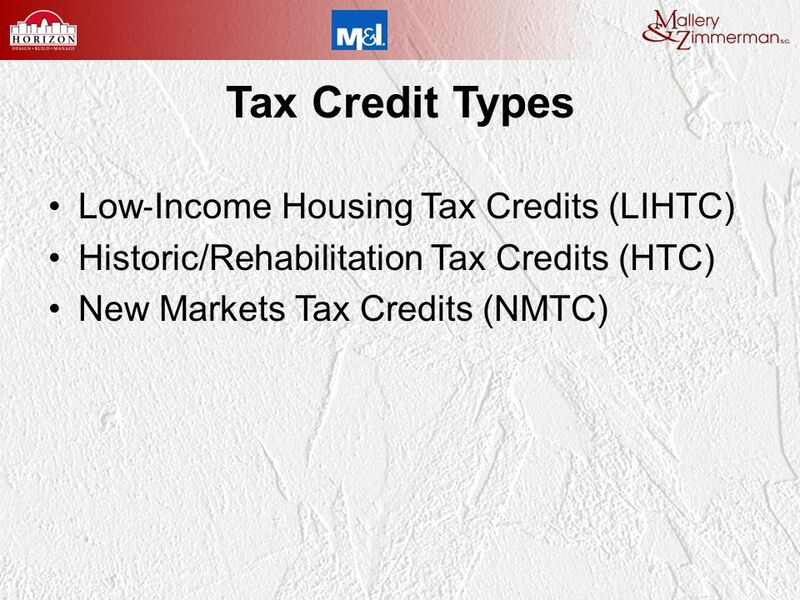 Using Historic Tax Credits in New York Combining HTCs and NMTCs Wednesday, June 24, 2009. 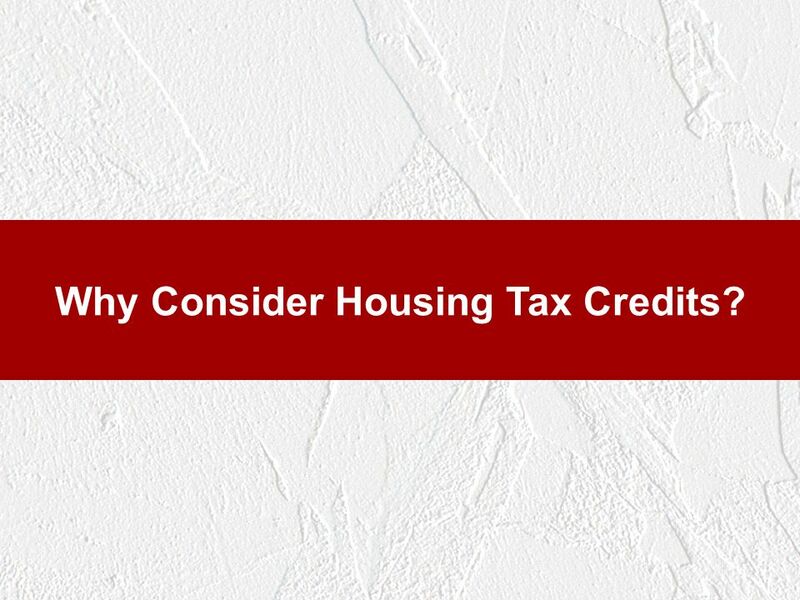 Rebuilding Communities After Hurricane Katrina With New Markets Tax Credits James D. Howard, Jr. TransCapital, LLC. 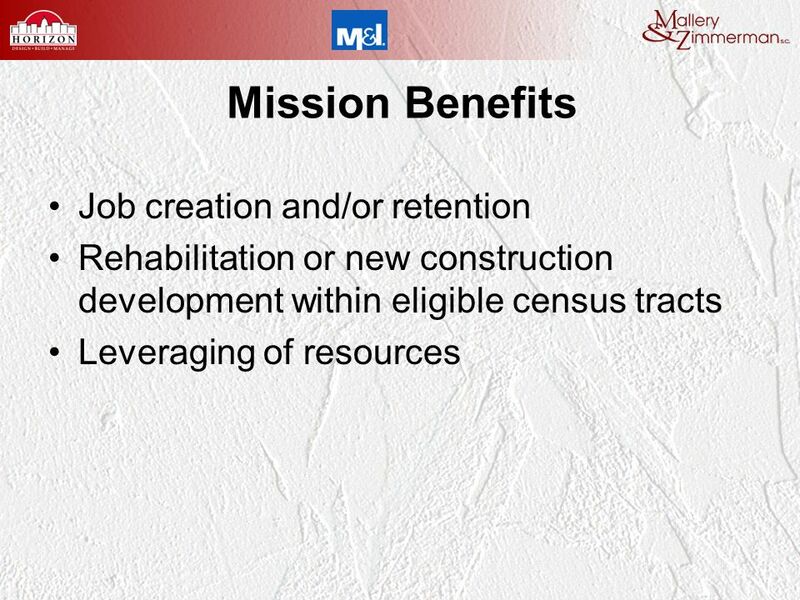 1 USBancorp Community Development Corporation New Markets Tax Credits: Creating Economic Opportunities in the Gulf Opportunity Zone IPED March 30, 2007. 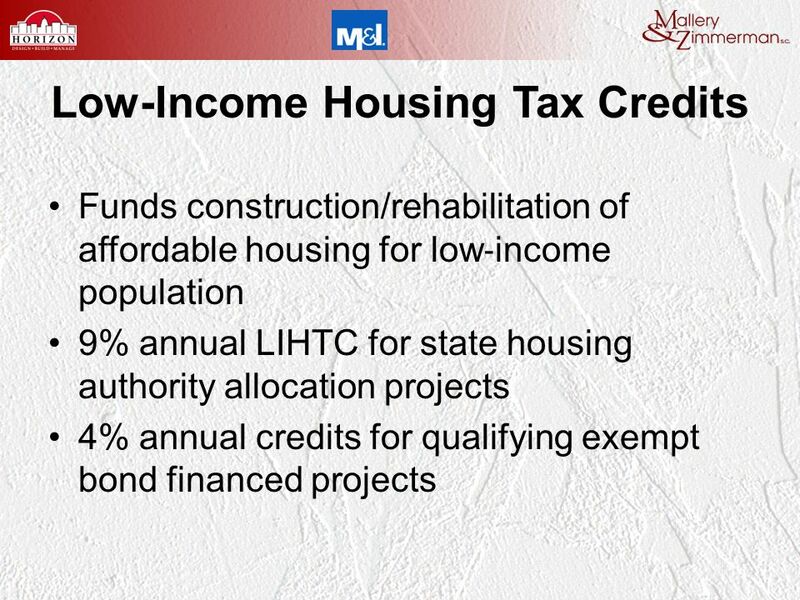 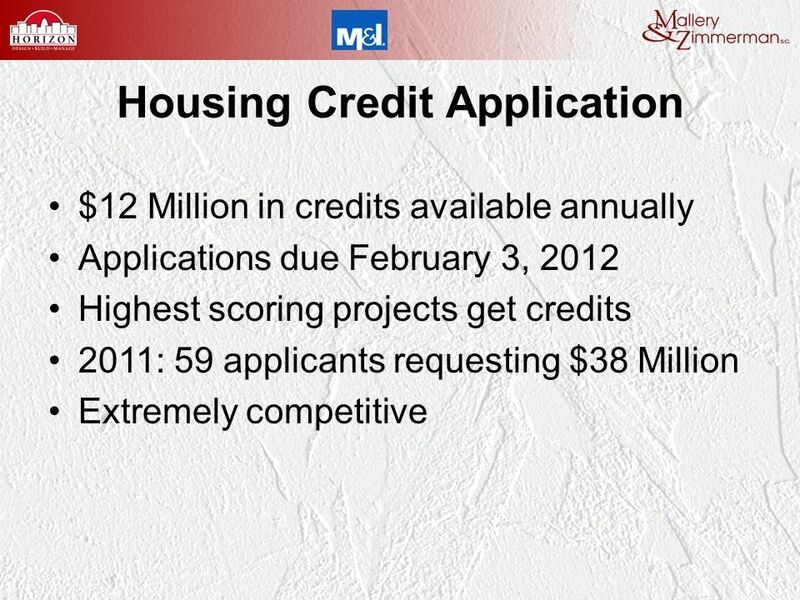 New Markets Tax Credits and Housing. 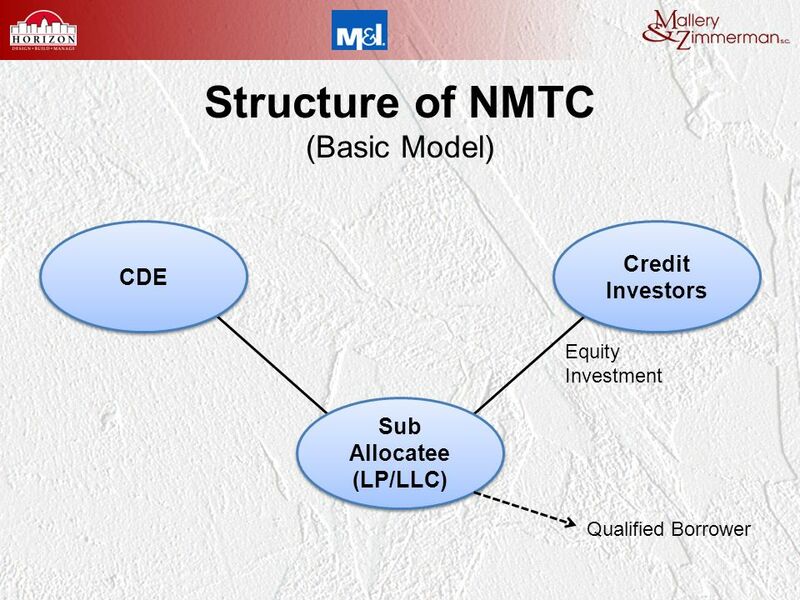 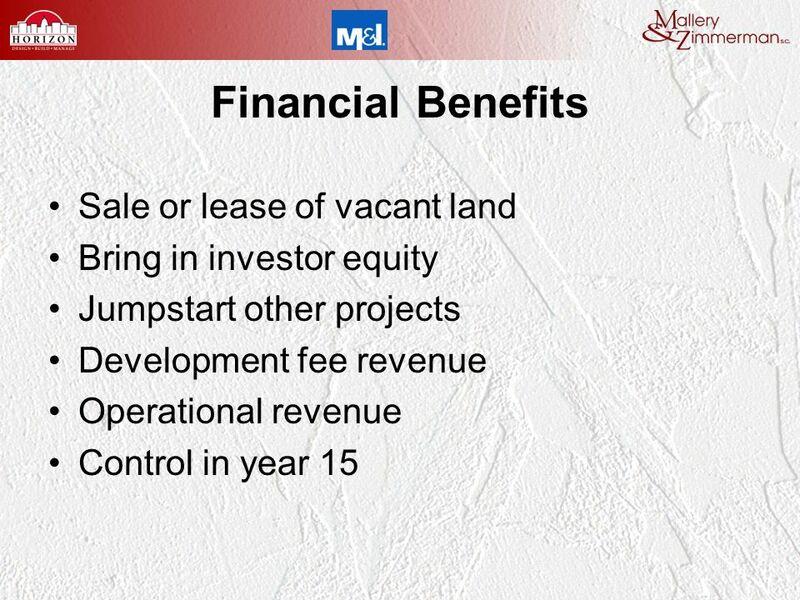 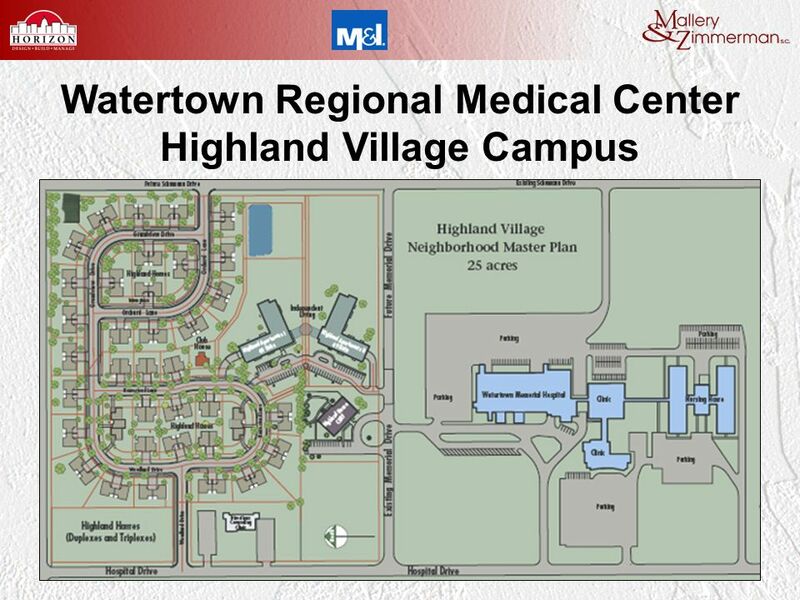 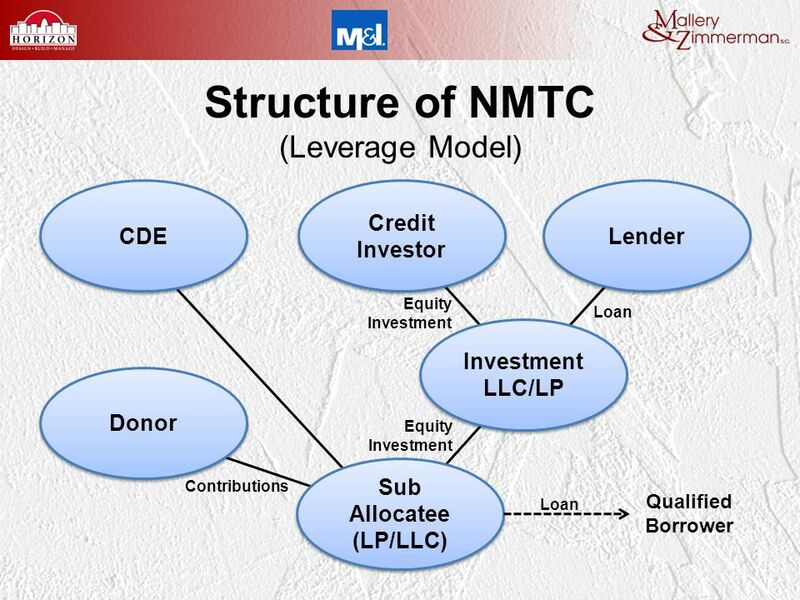 Common Misunderstandings About New Markets Tax Credits Commercial real estate development is the best use of NMTCs. 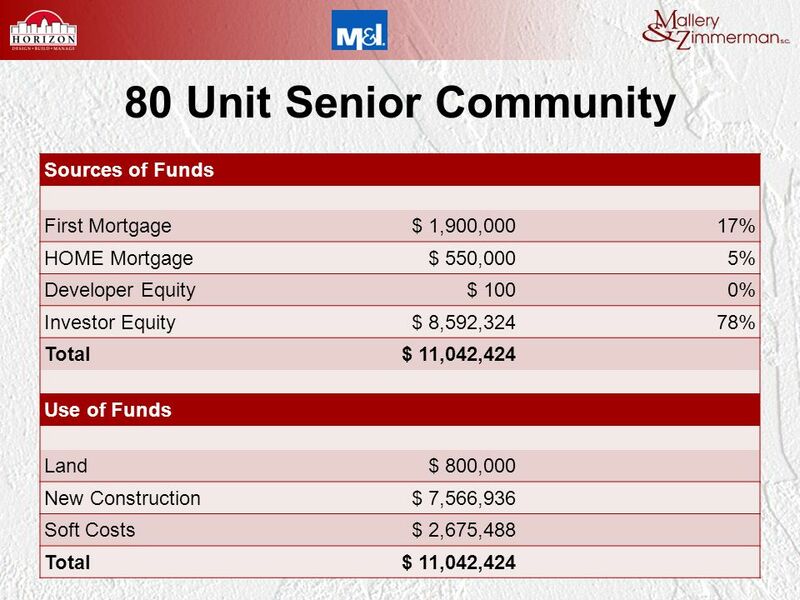 Community transformation diversity vision M C C ORMACK B ARON S ALAZAR Preservation Through LIHTC and HTC: Washington Apartments in St. Louis Jonathan. 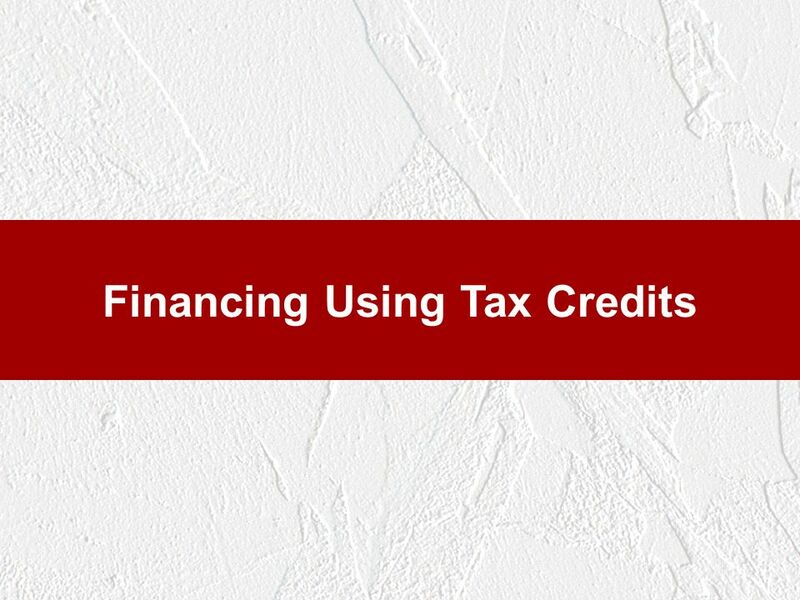 Syndication Leasing Structures How Tax Credits Become Capital: When and How to Syndicate Panel USING HISTORIC TAX CREDITS IN NEW YORK June 24, 2009.